If you�re looking for a set of Floor Liners or Cargo Liners that are superior to the competition, you�ve come to the right place. Husky Floor Liners and Cargo Liners, made by Husky Liners, offer a superior fitment because they designed specifically for your vehicle. Because of this, Husky Molded Floor Liners and Cargo Liners fit better, look better, and offer superior performance. You�ll get a set of liners that are durable enough to stand up to the elements. Husky's deep troughs will hold water, soda, dirt, mud, or whatever else you spill or step onto them. The raised perimeter around Husky floor mats contain spills and debris while the embossed ribbing keeps your feet elevated and out of the water, mud, and dirt. When it is time to clean your Husky Floor Mats, they�ll easily rinse clean with a garden hose. Additionally, unlike universal all weather floor mats, Husky All Weather Floor Mats will install perfectly every time and with ease since they are vehicle specific. Husky Liners come complete with their Sta-Put mounting system that holds the floor liners in place and keep them from shifting. Because Husky Floor Mats are made from highly durable thermoplastic, they will stand up to the weather and any additional beating you put them through. Sold as a pair that will cover both sides, your Husky Floor Liners are backed by a lifetime warranty. You can rest assured that they�ll be hard at work for as long as you own your vehicle. 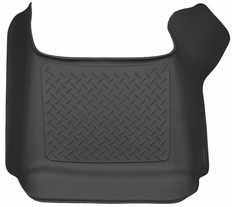 The part number for this item is 83711(Black) or 83712(Grey) (depending on your color choice) and this Front Center Hump Section Floor Liner fits 2002-2013 Dodge Ram 1500, 2003-2013 Dodge Ram 2500, 3500 (Crew and Mega Cabs)(Auto Trans Only) Models.